When Apple decided to announce their own social gaming network for iOS devices in the form Game Center, many speculated this would be the end of third party networks such as OpenFeint. However, the opposite appears to be true with founder of OpenFeint, Jason Citron, claiming the network has doubled to an impressive 50 million users with a 119% increase in games using the network since the launch of Apple’s Game Center. With Apple bringing attention to social gaming networks with Game Center, many developers have taken to including Game Center support as well as OpenFeint support into their new titles. This is of course in order to provide their users with the choice to use one or both networks as they please, meaning more and more devs have been including OpenFeint since the launch of GameCenter. Game Center allows you to invite friends and receive requests for games, manage one central friend list, and view achievements earned. 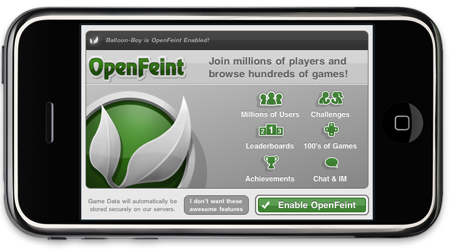 However, OpenFeint aims to provide features above and beyond what is offered with Game Center, one of which is integrated leaderboards and scoreboards. The company also plans to launch OpenFeint X, which will allow more functionality for in-game microtransactions.